*A LIMITED NUMBER OF MEDALS ARE STILL AVAILABLE AND ON CLEARANCE FOR $6.00 UNTIL THEY SELL OUT! YOUR MEDAL WILL SHIP WITHIN ONE WEEK OF SIGNING UP. COMPLETE YOUR RACE BY THE END OF 2017! November 20th is National Hug A Runner Day! In honor of this day we are dedicating our November virtual race to Hugging a Runner. This is a virtual event and any one from around the world is welcome to join us! We will honor one special runner each year on National Hug A Runner Day. This year’s runner is yet to be determined, but will be posted soon. 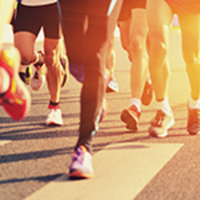 A portion of each registration for this race will be donated to SOLES 4 SOULS, an organization dedicated to providing shoes and clothing to people around the world. When: Complete your race any time between November 1 and November 30, 2016. Why: Because we want as many people as we can get to virtually run (or walk) a 5K and then go out and HUG YOUR FAVORITE RUNNER! Cost: $20. Includes custom medal and bib that will be shipped directly to you. Plus, at least 20% of every entry will be donated to SOLES 4 SOULS, an organization dedicated to providing shoes and clothing to people around the world. *We are in no way affiliated with this charity, we like to choose a different charity for each of our races and are happy to raise funds for them. Medals will be shipped out in October!